SafeWork Australia Essential Kit meeting National Safe Work Australia Code for use in all workplaces across Australia in First Aid Wall Cabinet Large with large weatherproof signs and 3M reflective striping, complying with Australian Standards for first aid signage and handle at the top for easily lifting off and returning to the wall if kit needs to be taken to the victim in an emergency. Size 28cmW x 44cmH x 14cmD - weight approx. 4.3kg. Meets all recommended general item requirements as documented by the National Safe Work Australia Code of Practice for First Aid in the Workplace. SafeWork Australia Essential Kit meeting National Safe Work Australia Code for use in all workplaces across Australia in First Aid Wall Cabinet Large with large weatherproof signs and 3M reflective striping, complying with Australian Standards for first aid signage and handle at the top for easily lifting off and returning to the wall if kit needs to be taken to the victim in an emergency. Size 28cmW x 44cmH x 14cmD - weight approx. 4.3kg. Meets all recommended general item requirements as documented by the National Safe Work Australia Code of Practice for First Aid in the Workplace. National Safework Australia Essential Kit meeting the National Safe Work Australia Code for use in all workplaces across Australia. Meets all recommended general item requirements as documented by the National Safe Work Australia Code of Practice for First Aid in the Workplace. 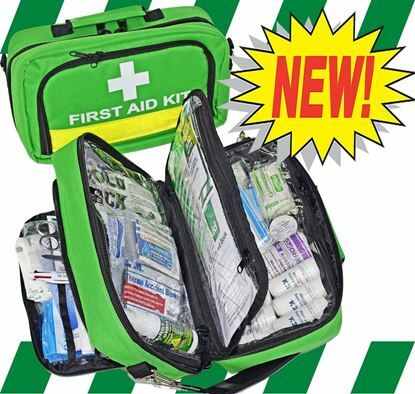 SafeWork Australia Essential Kit as recommended by the National Safe Work Australia body for use in all workplaces across Australia in Case Premium with multiple fold out compartments. Meets all recommended general item requirements as documented by the National Safe Work Australia Code of Practice for First Aid in the Workplace. Size: 33cmW x 20cmH x 15cmD closed - Less than 1.7kg full ! Bright first aid green quality 600D heavy duty canvas outer, with day/night high visibility reflective striping, labeled to Australian Standards for First Aid Kit use. This case bag is versatile. It comes with an adjustable heavy duty thick shoulder strap so the case can be worn over the shoulder or around the waist like a big bumbag. Clever design allows all pockets to be easily accessible from the top when worn around the waist or over the shoulder. 12 internal pockets are all see-through and the 4 main large compartments are zippered so you can see and instantly access everything at a glance. Clever drop-down front pocket designed to provide quick and easy access to initial and/or high frequency items, also with see-through pockets. SafeWork Australia Essential Kit meeting the National Safe Work Australia Code for use in all workplaces across Australia in Backpack Premium with multiple see-through pockets and 6 internal adjustable compartments. 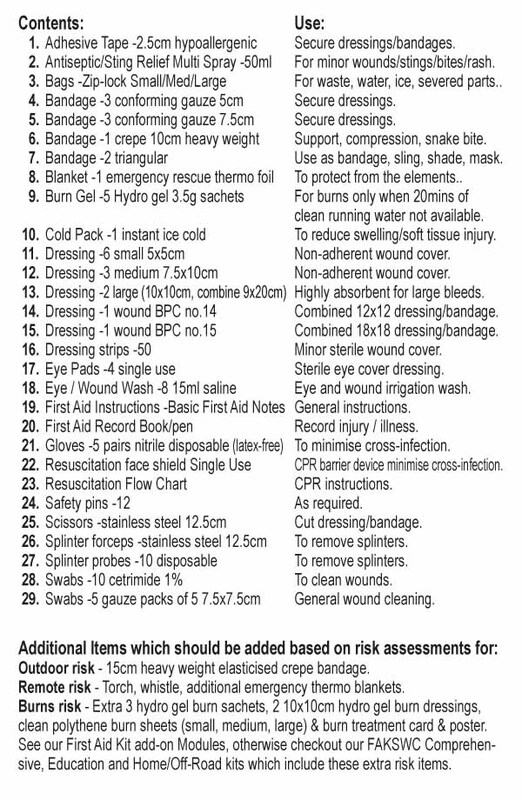 Meets all recommended general item requirements as documented by the National Safe Work Australia Code of Practice for First Aid in the Workplace. 38cmH x 30cmW x 17cmD - Weighs less than 2kg full! 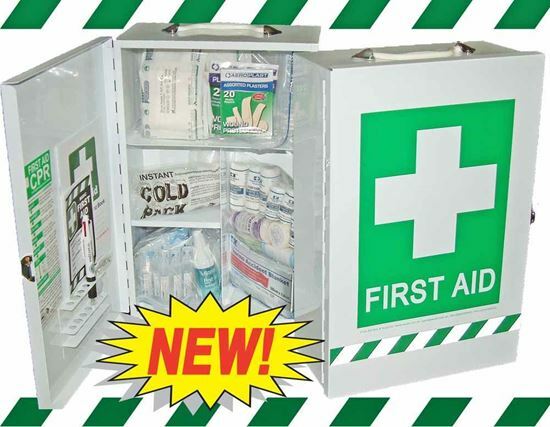 Internationally recognisable First Aid green outer with high visibility reflective band, printed brilliant white cross and 'First Aid Kit' complying with Australian Standards for first aid signage. Made from top quality robust 600D water repelling canvas material with black satin lining. Insulated padded walls and internal dividers which have clever velcro adjustable technology for creating the inside compartments to many combinations and size needs. Generous front zipped outer front pocket with main clam-shell lid opening to deep internal fully adjustable compartments. Lid opening has 6 see-through pockets of varying depths and widths. Top quality dual industrial zips. Adjustable padded shoulder straps. SafeWork Australia Essential Kit meeting the National Safe Work Australia Code for use in all workplaces across Australia in First Aid Box Medium with 2 fold-out trays, 3M Reflective top quality weather-proof vinyl first aid striping on 2 sides and 3M reflective First Aid Kit label complying with Australian Standards for first aid labelling. Meets all recommended general item requirements as documented by the National Safe Work Australia Code of Practice for First Aid in the Workplace. Closed dimensions approx. 40cmL x 23cmW x 20cmH, weighing less than 3kg full!